The agreement was initiated at the EFTA Secretariat in Brussels. 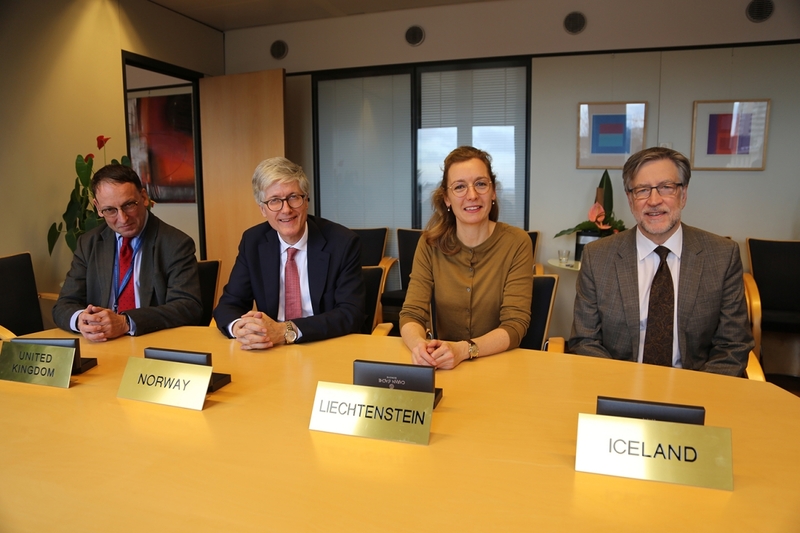 From left: Ivan Smyth, Legal Counsellor of the UK representation to the EU, Rolf Einar Fife, Ambassador of Norway to the EU, Sabine Monauni, Ambassador of Liechtenstein to the EU, and Gunnar Pálsson, Ambassador of Iceland to the EU. The agreement ensures that EEA EFTA nationals in the UK and UK nationals in the EEA EFTA States will maintain broadly the same rights as today when the UK leaves the EU. In December we published a separation agreement between the EEA EFTA States and the UK, which covers citizens’ rights as well as other separation issues. This EEA EFTA-UK separation agreement will only apply if the Withdrawal Agreement is concluded between the EU and the UK. This means that citizens´ rights have been secured regardless of the outcome of the negotiations between the EU and the UK.